The Newbery Medal-winning author of Walk Two Moons, Sharon Creech, brings readers a story with enormous heart. 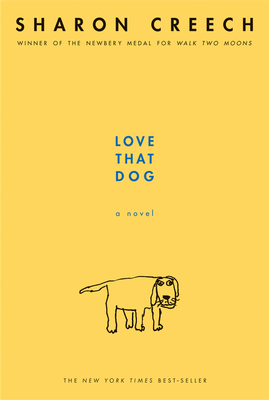 Love That Dog shows how one boy named Jack finds his voice with the help of a teacher, a pencil, some yellow paper, and of course, a dog. Written as a series of free-verse poems from Jack's point of view, and with classic poetry included in the back matter, this novel is perfect for kids and teachers, too. Sharon Creech has written twenty-one books for young people and is published in over twenty languages. Her books have received awards in both the U.S. and abroad, including the Newbery Medal for Walk Two Moons, the Newbery Honor for The Wanderer, and Great Britain’s Carnegie Medal for Ruby Holler. Before beginning her writing career, Sharon Creech taught English for fifteen years in England and Switzerland. She and her husband now live in Maine, “lured there by our grandchildren,” Creech says.